[Friday, February 1, 2008] The purpose of Revision C to RFP 10-99-0021 is to revise the Executive Summary regarding the remaining order years of the NLS RFP. [Thursday, February 7, 2008] The X PRIZE Foundation will announce the first group of teams registered to compete for the $30 million Google Lunar X PRIZE on Thursday, Feb. 21 at Google Headquarters in Mountain View, CA. A new preferred partner will also be announced. [Monday, February 11, 2008] A former Boeing engineer was arrested after he stole Boeing trade secrets related to several aerospace programs, including the Space Shuttle. [Tuesday, February 12, 2008] NASA Exploration Systems Mission Directorate managers will host a media teleconference Tuesday, Feb. 19, to announce the names of one or more companies selected to develop and demonstrate commercial orbital transportation services. [Wednesday, February 13, 2008] "Thank you for the opportunity to appear today to discuss the various aspects of the Space Program after the Shuttle is retired, including the status of space transportation in support of the International Space Station (ISS)." [Friday, February 15, 2008] Commercial, weightless flights will be offered this weekend at Moffett Field, Calif., under the terms of an agreement with the Zero Gravity Corp, Las Vegas. [Monday, February 18, 2008] During the unforgettable weightless escapade, Newsom and Siebel flew like Superman, flipped like Olympic gymnasts and enjoyed 10-times more hang-time than the world's best basketball player. [Tuesday, February 19, 2008] According to NASA's Doug Cooke the winning proposal of the COTS-1 re-competition is Orbital Sciences Corporation. 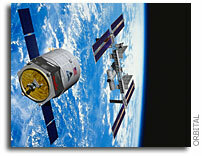 [Wednesday, February 20, 2008] Orbital Sciences Corporation announced today that it has been selected by NASA to demonstrate a new space transportation system for delivering cargo to the International Space Station (ISS). [Friday, February 22, 2008] The X PRIZE Foundation and Google, Inc. today announced the first ten teams to register for the Google Lunar X PRIZE, a robotic race to the Moon to win a remarkable $30 million in prizes. [Monday, February 25, 2008] Raytheon Company technology played a pivotal role in the Feb. 20 successful intercept of a non-functioning satellite. [Monday, February 25, 2008] Outer space will rocket into reality as "the" getaway of this century, according to researchers at the University of Delaware and the University of Rome La Sapienza. [Monday, February 25, 2008] According to sources, Jeff Bezos' company Blue Origin has reportedly bought a 32,000 acre ranch a few miles north of Sierra Blanca, Texas to use as a launch site. [Tuesday, February 26, 2008] On October 23, 2006, NASA published a notice of proposed rulemaking, Cross-Waiver of Liability, 71 FR 62061 (October 23, 2006), which discussed the background of Part 1266 and the use of cross-waivers in various NASA agreements. .
[Tuesday, February 26, 2008] NASA has added to its Web site an interactive program that allows users to discover some of the many NASA technologies that positively impact everyday life. [Tuesday, February 26, 2008] NASA has presented its highest honor for quality and technical performance, the George M. Low Award, to four companies committed to innovative management, process quality and customer service. [Thursday, February 28, 2008] This notice is to apprise interested parties of the current planning schedule for competition of the Constellation ground processing, provide high level information on the potential requirements, acquisition approach, and solicit industry input.